1)When Your Rising Falls in Cancer Rashi then You belongs to Cancer Ascendant. 1st House is Cancer Rashi and lord is Moon. Moon is also Lagan lord. 2nd House is Leo rashi and Lord is Sun. 3rd house is Virgo rashi and Lord is Mercury. 4th House is Libra rashi and Lord is Venus. 5th house is Scorpion rashi and Lord is Mars. 6th house is Sagittarius rashi and Lord is Jupiter. 7th House is Capricorn rashi and Lord is Saturn. 8th House is Aquarius rashi and Lord is Saturn. 9th house is Pisces rashi and Lord is Jupiter. 10th house is Aries rashi and Lord is Mars. 11th house is Tarush rashi and Lord is Venus. 12th house is Gemini rashi and Lord is Mercury. Mars—Mars is Lord of 5th and 10th house. Mars is Most benefice for Cancer(5th lord is benefice and 10th lord due to Kendradipati Dosh is benefice) so Mars is Most benefice. Again due to lordship of Kendra(Vishnu sthan) and Kona(Lakshmi sthan) at same time Mars is a yogkarak planet For Cancer Ascendant. Means where mars is sit in cancer Ascendant chart Mars give a Rajyyog results. Jupiter—Jupiter is Lord of Most benefice Kona. So Jupiter is second Benefice for Cancer Ascendant. Mercury–Mercury is Lord of two Dussthan(lord of 3rd and 12th house) also Moon is enemy for Mercury so Mercury is worse Malefic For Cancer Ascendant. Venus–Venus is Lord of 4th house(Kendradipati Dosh) so malefic and Lord of 11th house so malefic. So venus is also bad for Cancer. Moon—Moon is Lord of 1st house But is neutral for Cancer Ascendant.Same time benific(Lord of lagan) and Lord of Kendra(Kendradipati Dosh) so it is Neutral. 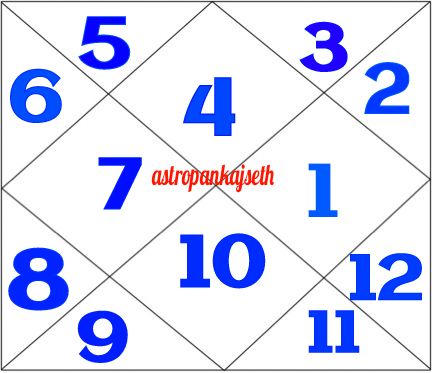 Saturn—Saturn is Lord of 7th(Kendradipati Dosh) is Benific and Lord of 8th house ( Dussthan) Melific so Saturn is Neutral for Cancer Ascendant. Sun— Sun is Lord of 2nd house so it is Neutral. Marak—Saturn is Prime Marak for Cancer Ascendant. Sun is also Marak as lord of 2nd house. But Most Marak acting planet is Mercury. 1st house of cancer Ascendant is cancer rashi and Lord is moon so body constitutions depand on cancer rashi and Lord moon . So Cancer natives are Medium in heights(Cancer rashi indicating medium height).Full round shape face(Cancer shape is just like circle).Fair color(Both cancer and Moon is indicating fair color). Also charming and attraction in there face(cancer charming and Leo give magnetic Attraction). 6)Mentality —- Mentality, nature and behavior depend on 1st and 5th house. 1st house is cancer and Lord is moon so they are emotional again 5th house Scorpion is also water rashi so mentality is Emotional. So they are very emotional and sensitive(Scorpion 5th house). 4th house is libra so they Mind is Active(Flying mind as Air sign) but 5th house Scorpion make there active mind just volatile type. So they quickly show there emotinol Tamper. Also this position make him Just disturbed(A lot of thinking and getting just emotional or feeling oriented).They are music lover(Mind libra wants music,Entertainment). Cancer Native are Aggressive(Leo in 2nd) in speech but a good in communication(Virgo). So there speech are looking good. Spirituality is other mental behavior of cancer(5th house Water sign and scorpion and 9th Pisces both are very spiritual rashi). Cancer Ascendant is home lover so they are true care of there family. 3rd house Virgo makes him a self confident also Sagittarius 6th house increase there mental strength. But there emotinol nature is true problem creator in there life.Other one problem is effect of scorpion(Hidden quality and dangerous one rashi) in there mentality.